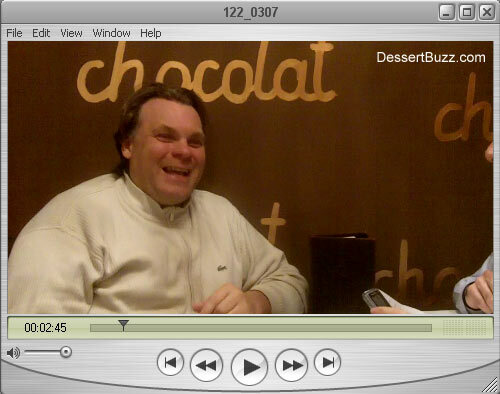 Dessert Buzz sat down with Francois Payard last Friday for an expansive interview where he discussed some of his upcoming plans in New York, his opinions on the current cupcake craze, what New York desserts he has been enjoying, which New York City pastry chefs he thinks are doing great work and finally he professes his love for chocolate chip cookies. DessertBuzz: How’s the Chocolate bar going? Francois Payard: Good, you know it’s a small thing. It’s just a small chocolate bar, the idea was to do something really nice on Madison Ave. The whole concept is all about chocolate. It’s something different than Payard because I may reopen Payardvery soon but at that time I was looking, the Chocolate Bar was the perfect thing. It was very European, people can come (toMauboussin) to buy jewelery, have a cup of hot chocolate or a cookie or a chocolate. I think it’s very nice but at the same time, as I wrote on the wall [points to whimsical script writing on the wall] it’s very “kid-ish” and elegant, fun though, I want to make everyone very comfortable, it’s Madison Ave, and I don’t want people to think “oh, I can not afford!”. DB: Yes, people who appreciate great pastry, can sit down and experience these desserts for maybe $10 or less and don’t have to spend $200 at a meal at Bouley first. FP [laughs] Yes, I think everything is very affordable, only $6.50 for a pastry or $2 for a macaron, but we are using all very different ingredients, like fresh yuzu from Japan and yuzu juice using a lot of things and the idea was to try be fun but to affordable on Madison Ave. On the weekends we are very busy, but at the same time I want it to be busy but not crazy, like before. Busy, but elegant like I don’t want it to be like Payardwas sometimes. DB: What is next for Francois Payard? FP: What’s left is to challenge yourself every day. I pretty much lost everything, I have had to start from scratch after losing the place on Madison Avenue. It’s what we are going to do when we open this new place and I think what people don’t like to do in general is to challenge themselves, but I like challenges, it’s what keeps me fresh and keeps me going. We’ll start all over again and open two new places at the same time and that’s what I have to do to get back to where I was when I closed Lexington Ave.
DB: Are these places going to be in New York? DB: I didn’t know this. DB: Wait, are you breaking this news to DessertBuzz [laughs]? DB: Can you tell me anything about either of them? FP: No, not yet, you know we are signing the lease on Monday (2/8/2010). And when the lease is signed we will talk more about it. DB: Can you tell me if it’s going to be a restaurant or dessert destination? FP: No, it won’t be a restaurant this time because of the location we are looking at. It will be two pastry shop cafe’s at the same time with very big production capability. FP: A lot of these concepts we do at the chocolate bar I wish we could find a location to do downtown. It would be the same idea with the brick (exposed brick wall like at Chocolate Bar), rustic tables, it would be a cool place for the young people and the idea I think is good it’s easy to manage and I think it’s a very different way to have a bakery and I know hot chocolate is much more winter but where is a place where is a place where you can have hot chocolate? Even at Bouley Bakery someone was asking me to send the chocolate for hot chocolate for them because people in America, they love cookies, you see they are the biggest things. DB: Yes, I know. I am going to nail you down to see which ones (in New York) you like, I know you have a lot of friends. FP: It’s not about which one I like. You know we make different things for different tastes and everybody is always happy. I decided not make chocolate chip cookie like in America, why? I am French! But we created a flourless cookie and everybody was talking about it. But I have a friend who is making an incredible chocolate chip cookie with a few different recipes and to tell you the truth they are very good. I don’t know which (chef) makes the best because it is not really my forte but many places make a good one, and this guy who works for me makes a very, very good one and I used to love them to tell you the truth, I love cookies much more than pastry, but I won’t be able to tell you which is the best, it depends on how fresh they are – that’s the number one thing. Are they fresh baked or are they 3 days old? DB: Are you familiar with the some of the destination dessert shops in New York City? FP: I think if somebody is looking for something it’s a nice bakery,(with) like everyday things to make them happy every day, you know the best cookie with a cup of coffee, a drink and everything. I think New York is a very special market, to tell you the truth, I don’t even know what people (many other pastry chefs) make in the city I just do what I do myself. People come to see what I do. If I have idea, if I make a cake my idea is mostly from Europe. DB: I read in another interview that you are influenced by members of the Relais Dessert group? FP: That’s the only influence I get. I’m the only one who’s a pastry shop in NY that’s like a pastry shop. I only look what I do I don’t look what (other) people do. DB: But you must go out (in New York) to dinner to nice restaurants do you get inspired at all? FP: Last night I had a very good dessert I went to Locanda Verde, very basic, they serve very simple, but very good execution. DB: That’s Karen Demasco, formerly of Craft. FP They were more like a homemade dessert but had very good taste. I had a cheesecake, a pumpkin? A squash? Something like that, very good, very simple. But you have to understand it’s two different worlds. A cake I can make, few people can make cake in this way, few people can be incredibly good at making a restaurant cake and a restaurant dessert. Go here for Part II and to see video. 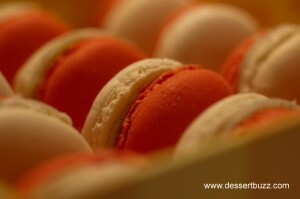 dessertbuzz » Blog Archive » Francois Chocolate Bar in the Plaza Hotel: Take in the Louvre! Dessertbuzz » Blog Archive » Francois Chocolate Bar still has some of the best pastry in NYC-if you can find the shop!